That should be read as a statement of fact, not as if I'd written the command, "People, send me dolls!" Not that there's anything wrong with that. 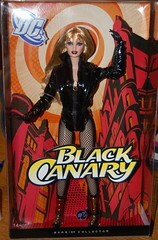 As I've explained before, many of my dolls are gifts. Whether they're beloved dolls from a person's collection that she (or he) donates to me so that I can include them in Beck's Museum of Dolls, Dolls, Dolls in the Attic!, or dolls that people find discounted or for sale in a thrift store or online, my doll population grows. I'm not complaining about that AT ALL. I love them, from the most battered, dog-gnawed Skipper to the priciest designer Barbie never removed from her box. These two Birthstone Barbies are recent additions to the collection. Mattel used the Model Muse body for them, and in Becky World, that can mean only one thing--you'll eventually be seeing them wearing my designs. As models, they get names. Since amethyst is my sister's birthstone and aquamarine is mine, I decided they should have names that are meaningful to us (and likely to no one else). Thus the redhead with the amethysts is now "Katie" and the blonde with the aquamarines is "Dandy." 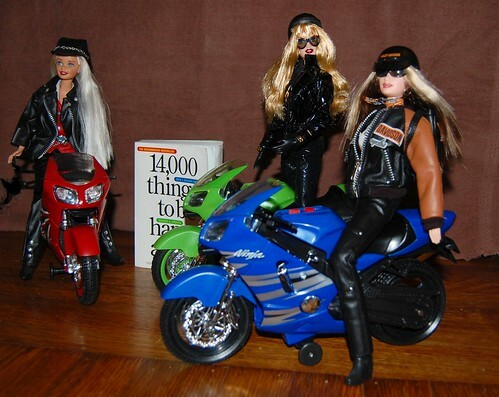 The Harley Barbies! These were provided by one of my favorite motorcyclists/writers, Linda Raven Moore, who wrote the wonderful A Little Twist of Texas (which I once reviewed here). For a while, the Harley Barbies were misplaced within the mysterious labyrinth of the postal system, but now they're free to ride. Today they're ready to wheel their way through the pages of the happiness book just for you. All you need to do is comment with a page number between 1 and 611, and another number between 1 and 25. Happy trails!